A standard denture is also known as artificial teeth. It is removable and made of a type of plastic like material known as acrylic. This plastic plate houses acrylic teeth to replace those that are missing inside your mouth. The plate is pink to mimic your gums and the acrylic teeth are chosen to suit the size and color of your existing teeth. If you lost all your teeth the dentist would choose a color that you prefer. Standard dentures are affordable dentures compared to permanent dentures. Full dentures are for those who lost all their teeth. Partial dentures are for people who still maintain certain numbers of natural teeth. Sometimes, metal alloy is incorporated into a denture to strengthen it. Stainless steel wires or clasps are also added for addition retention and pressure reduction on gums. How do I know I am suitable for a denture? If you lost one or more natural teeth you can opt for denture. However it is important to get a dental consultation because some medical problems may complicate denture usage, for example Parkinson’s disease, severe dementia, uncontrolled epilepsy. Sometimes, dentist would take x rays to rule out any abnormalities inside your jaw bone before a denture is constructed. When you go for consultation, dentists would check your dental and gum condition before proceeding. All decays should be filled and gum problems should be controlled before fabricating a denture. If everything goes well, a mould of your upper and lower jaw would be taken. Secondly, bite registration would be done to see how your jaws bite together. Next, it would be tooth try in stage where lab technician arranges acrylic teeth onto a wax plate to be placed inside your mouth that would mimic the real denture. If you like it, the last step would be issuing the real denture to you. You need to return for reviews to trim off any region of denture causing sore spots on your gums or causing you to gag. Mostly you need to review a few times before a final perfectly fitting denture is issued. Usually it is advisable to wait for an extraction socket to heal completely before constructing a denture. Healing usually takes a month in normal extraction cases. In case you need to replace extracted tooth as soon as possible, dentist could do immediate dentures for you. A mould of your jaw is taken before extraction of your tooth. The lab technician would remove the tooth that is planned for extraction on the mould and fabricate a denture without it. Dentist will issue the denture to you right after your extraction. Because your gums tend to recede after extraction, your denture would be loose. Thus, you need to return for denture relining. This is not advisable for full denture case. If you have a present denture, you could add a tooth to the present denture while waiting for the gums to heal. How to put on and use a denture properly? Always learn to insert and remove a denture from your dentist. Always show the dentist your insertion and removal before you leave the clinic to see if it is correct. Ask for advice if there are problems or pain with insertion or removal as dentist could alter the path of insertion to ease you. Use finger pressure to seat the denture, do not bite it in. Biting would cause cracks and fracture of denture as the force of insertion is uneven. Try to speak frequently or read an article out loud with the new denture to get used to it faster. Initial increased salivation is normal because there is a foreign matter inside your mouth. It would improve in 2-5 days. Try to eat on both sides or the denture may rock and cause unnecessary cracks and breaks. How to soothe denture pain? Stop wearing the denture and return to the dentist for adjustments whenever you have denture pain or sore spots. After adjustments, try eating soft food before going into hard ones. If the sore spots are ulcerated, leave the denture out for at least 3 days before putting it on again to allow the gums to heal. Ulcer creams are helpful sometimes. If the pain is persistent, try to check for any allergies towards denture material, any dry mouth condition or the denture is probably distorted or ill fitting. Try to prevent wearing denture too long. Please remove denture at sleep. Some form of nerve problems might cause persistent pain such as trigeminal neuralgia which is entirely not due to your denture. How to manage loose dentures? You can put on denture adhesive powder, cream, paste or strip to stick the denture to your gums. The denture adhesive needs to be cleaned and remove everyday at night. It is not toxic but sometimes cream and paste type is difficult to clean. If denture adhesive does not help, a new denture may be required. Denture adhesive is contraindicated for ill fitting denture. Please get dental consultation before using a dental adhesive. Excessive bone loss may indicate implant supported permanent denture or mini dental implant stabilization of denture. How to clean a denture? Normal brushing with soft bristled denture brushes in denture toothpaste or soap water. It is important to clean the denture on top of a basin of water or folded towel to prevent accidental breakage when it slips. It is advisable to use denture cleanser or denture cleaner as they can remove tough stains and tartar. Denture cleansers come in tablet, solution and wipe form. You can soak cleaned denture in a container or a denture bath. Ultrasonic denture cleaner cleans denture better as it allows denture cleanser to go into crevices and cracks to rid off stains. Some with UV light could provide antibacterial effect. What happens if my denture is dirty? You will develop foul breaths, gum diseases, candidiasis and denture stomatitis. Trapped food and bacteria will cause caries to your remaining natural teeth. You may lose even more natural teeth in time. What does ill fitting dentures cause? Permanent dentures are not removable dentures. It replaces missing teeth and it is fixed onto dental implants or teeth inside your mouth. It is more expensive than standard denture. A dental bridge is a permanent denture that relies on your existing teeth for support. The teeth immediately next to the missing tooth would be reshaped and made smaller for a construction of a set of linked crowns. 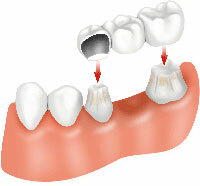 A missing tooth would require a 3-unit- dental bridge. An implant supported permanent denture or denture implant is supported by dental implants surgically placed inside your jaw. This method takes time as you need to wait 3 to 6 months for the dental implants to adhere to your jaw bone before a permanent denture is placed on top of it. It has better longevity compared to a standard denture as dental implant will maintain your jaw bone level and prevent it from further receding. A standard denture needs to be relined or redone once in 3-5 years as it will loosen due to ongoing bone recession. Cost differs with material used and number of units required. Permanent denture involving dental implants is more expensive than fixed bridges. Costs also differ geographically. Developing countries are usually cheaper. Each dental bridge costs around $200 to $2,000. Most dental insurances cover 50% of its total cost. Each dental implant costs $2,000 to $5,000. A full arch dental implants cost $24,000 to $100,000. Usually it is not covered by dental insurance. Cost of such in Malaysia is one of the lowest in South East Asia. You will be able to enjoy quality work with half the price. Is there a cheaper way besides permanent denture? This is a new method to stabilize a loose denture. No surgery is required and you can go home with stable dentures in one visit to the dentist. Mini dental implant is a miniature type of dental implant which is screwed to your jaw bone with certain devices. It is done under local anesthesia. There are adjustments made to your present denture to retrofit with the mini implants. You could choose to redo a new denture if you want before retrofitting. Their costs are one quarter to one third of a standard dental implant. Result is more promising as there is not waiting period for the implant to adhere to bone. Mini implant adheres to bone instantly when it is screwed in. Post operative pain is minimal and you can use your denture instantly. Removable denture needs to be changed or relined once in 3-5 years as your bone recedes. Dental bridges would stay satisfactory in 10-15 years unless gum recession sets in where food impaction or esthetic becomes a problem. Denture implant has better longevity as it prevent further bone loss and has higher strength in force loading. It has no specific claimed duration of longevity but is claimed to last longer than dental bridges and denture if meticulous oral hygiene and routine dental check up are maintained. Price wise, removable denture is the cheapest followed by dental bridges and the most expensive is restoration incorporating dental implant. Cost of implant supported denture varies with types and numbers of dental implants used, whether bone grafts are required and types of denture supports that are required with the final restoration. Denture implants and dental bridges are easily adapted by you because they accommodate lesser space in the mouth. They enhance or act exactly like what you have before you lost your teeth. A single dental implant to replace a single missing tooth is by far the most easily adapted. Denture uses wide plate for better coverage and better retention. Lower dentures are difficult to adapt because of the presence of the tongue. There is no difficulty in speech or increase salivation in permanent denture. A removable denture may alter speech in some way initially where you will adapt soon. Not all are good candidate of dental bridges or dental implants. Your adjacent teeth of the missing tooth or teeth have to be healthy and free of gum disease in order to do a dental bridge. Your bone has to be sufficient or you can take bone graft procedures for a stable dental implant. Smokers usually have failing dental implants. Everyone is suitable for a denture except for those with impaired general health, convulsion or severe asthma. Denture and dental bridges do not require any form of surgery mostly. Putting in a dental implant involves surgery and could result in pain, bruises or swelling for a couple of days after the procedure. 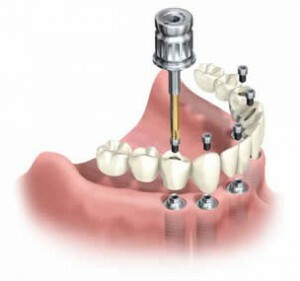 If the dental implant fails in the first time, putting in the second time would involve surgery again. If you have insufficient bone, a bone graft is required, which is also a form of surgery. You will see instant results with denture or dental bridges. For dental implants or dental implants supported denture, you will only get the true results when the implants are stable and ready for function. Whether you choose to have a removable or permanent denture, it is always advisable to understand the risks and benefit of procedures involved, the cost, pros and cons and outcome of the choice. Another important matter is to fully understand and maintain the oral hygiene instructions and specific care advices given for better longevity of the chosen treatment. You can always switch from removable to permanent denture or vice versa if you feel the previous choice does not suit you. You could use any denture cleaner available to clean your partials provided your dentures are made of acrylic. If you have a metal base denture then you need to read the instructions of the denture cleaner whether they would corrode your metal frame. You could still use normal hand soap or denture toothpaste with denture brush to clean your partials well. Best wishes.